Lubor On Tech: Pinterest is Growing - What Will Big Media Do? Anyway, back to Pinterest - I can see the potential of this new service. Creating a collection of online pictures can be very useful for projects, as a collection of visual ideas, or as a fan page of any kind. But here comes the challenge. I am pretty sure that Pinterest is copying the pictures on its site which is probably a copyright infringement. It does preserve the link to the picture source which would probably placate image sources such as Flickr that essentially want to be pretty open and are content with sharing as long as the attribution is made. But take my example of Drobny. There are probably no more than 20 of his pictures in existence online and most of the good ones are on sites such as Getty Images and Corbis. Of course I have included those images in my Pinterest board which I am pretty sure violates some copyrights or distribution rights. Unlike Flickr, Getty and Corbis are in the business of selling pictures for hefty prices and their customers are usually not individuals but businesses that purchase or license the pictures primarily for promotional purposes. The big question is, what will Big Media do - Getty, Corbis but also most magazine publishers? On one hand, this is clearly violating their fundamental business principles. After all, if you want to publish a Getty picture on your site, you have to pay for it. Sure, you could also argue that Getty and Corbis only allow me to post a thumbnail of the images but I suspect that’s just a technical detail. The main principle - I am posting their content on my page is no doubt raising some bushy Big Media eyebrows. On the other hand, my online scrapbook hasn’t really harmed Getty, Corbis or any of the other sources. 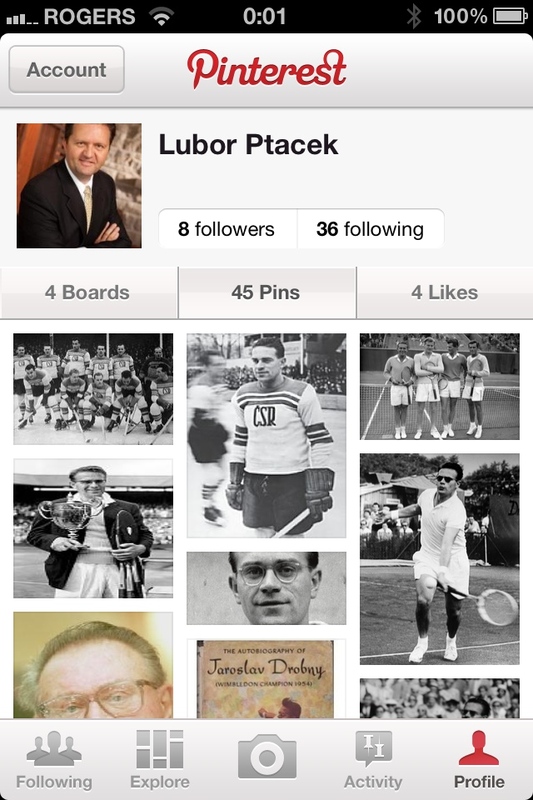 On Pinterest, I have no way to monetize the traffic from all the Jaroslav Drobny fans around the world. At least not yet. If anything, I have advertised the paid content. You could argue that I have created for free an online catalog for Getty - a catalog that can take advantage of the social powers of Pinterest since the Pinterest boards can have multiple contributors. That’s actually a pretty good resource for Getty if you ask me. But I am not sure which tactic the Big Media companies will use. What I do know is that they are faced with yet another possible disruption. Something new that came out of nowhere and that is becoming hugely popular. There are the first signs that indicate Big Media is noticing and their initial reaction is - yet again - an attempt to squash the intruder. Under media pressure, Pinterest just started allowing sites to opt out of their service. Well, I’m not sure that’s the best course of action for Big Media but I am not surprised as this has been their usual modus operandi ever since the World Wide Web has emerged. Interesting, so your position is that if breaking copyright laws has no negative effect on the copyright owner then you aren't really doing anything wrong. By that logic any person or business that decides to use the software you build isn't really doing you any harm as long as they don't try to make money on it. "On the other hand, my online scrapbook hasn’t really harmed Getty, Corbis or any of the other sources." That would be true if I used your software for my company without paying you, so that would be okay with you? I didn't think so. If you believe in copyrights, as ANY commercial software vendor must, then you must also believe that it is up to that owner to decide how they should use the images/content ... including DENYING you the right to use it. If you want to know how "BIG MEDIA" will react, just ask your own company how it will react when people share your programs they way that you share the pictures. Hypocrisy is what I read in your words, you don't believe in IP unless it suits you to believe in IP. I have tried to outline the two possible approaches for the Big Media. I have made it clear that I do believe that there is a very plausible interpretation by which the Pinterest activity violates the copyrights. The Big Media may have the right to sue Pinterest for infringement. But I have also suggested that there is a way for Big Media to leverage Pinterest as a new marketing and sales channel. I have expressed doubts that the media companies will take this approach but it would probably be better for them in the long term. Great comment, Lance. That is certainly an issue that will cause some turmoil should Pinterest turn out to be a success from a marketing or revenue generating point of view. If Pinterest is guilty of copyright infringement then so are its users that infringe ... including you as you freely admit to using it and posting what you concede is likely protected content. You even seem to lean towards believing there is copyright infringement going on but you do it anyway suggesting it is Pinterest that is infringing (if anyone) but that in your case it is justified because in your view your actions haven’t "really harmed Getty, Corbis or any of the other sources". But it was you that did the posting, the decision had nothing to do with Pinterest and it isn't up to you to decide whether there is harm done. The hypocrisy is because you work for a company that would not allow their IP to be used by others without compensation, you promote that attitude by marketing and selling fiercely protected copyrighted software and yet when the shoe is on the other foot you easily come up with reasons that you are allowed to break copyright. And what does my identity have to do with your actions? As an online magazine editor (small time) I love when people repin my pages. It means I get more traffic. And yes we do sell some professional photos by my photographers and I do not want those to be blown up and reprinted without people paying for them. On the other hand I want the thumbnails pinned, so that my photogs and their photos get more publicity. You want a quality photo or print you need to come to my site and buy it. Free publicity is free publicity. On a private level I am a food blogger for foodbuzz.com. I am pretty sure they have opted out since you can't pin a post if it is reached through their site. You have to circumvent their link and go straight to the blog to pin a recipe. Here again I want people pinning my recipes. I want them returning to my site because I get paid per viewership and I want readers to easily interact with my food blog because that means loyal users. I don't want people reposting my work as their own on their blogs or sites. That is copyright infringement but if you are posting a teaser or a pin that links back to my site and my blog. Hurrah! Thank you for your comment, Rachelle. I am pleased to hear you say that you see Pinterest as an opportunity rather than a threat. That was exactly what was on my mind when writing the post. I've now seen a lot of people using Pinterest to share their favorite book ideas. That's another great example of Pinterest enabling free advertising.